Viewsonic will be showing off the EXODESK at CES this year, which bodes well for the fledgling ecosystem. The original EXO-UI was developed for the EXOPC, a Windows 7 tablet PC that hit the market earlier in 2011. It basically created a great touchscreen interface that is normally not seen in Windows based tablets. They created their own app store that features very touch friendly applications and games. Later in the year, Skytex licensed the entire EXOPC UI and ecosystem and integrated it into their S-Series Tablet PC. EXOPC told us in an exclusive interview a while back that they were getting out of the hardware game and developing software. Since Viewsonic will be making the devices, ECOPC is relegated to developing and supporting it by committing one million dollars in developing new apps for the desktop interface. 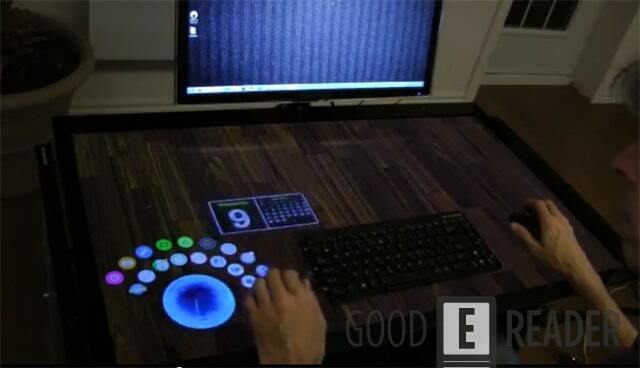 The EXODESK is a new product we revealed a few months ago. There are two models being developed, one that taps into your PC to draw the juice and one with an accompanied system. You can think of it as an overlay to your existing desk that allows you to launch apps, play games, and be productive. Some of the demos the company has launched lately has shown someone playing the piano and looking at their Twitter timeline. Ideally, at $1200 for the system it will meet most people’s price points. I don’t like running more than one monitor and being able to check out Facebook, Twitter, and News Widgets is a great way to be productive. It will be interesting to see how this ecosystem develops with the advent of Windows 8 and the touchscreen friendly nature of it, and you have to wonder if most of the features Windows 8 brings to the tablet will hinder the EXO-UI. first off whatever happened to that Skytab review? Second I am very glad they invested that much into app developing. Hope they have an air hockey app!